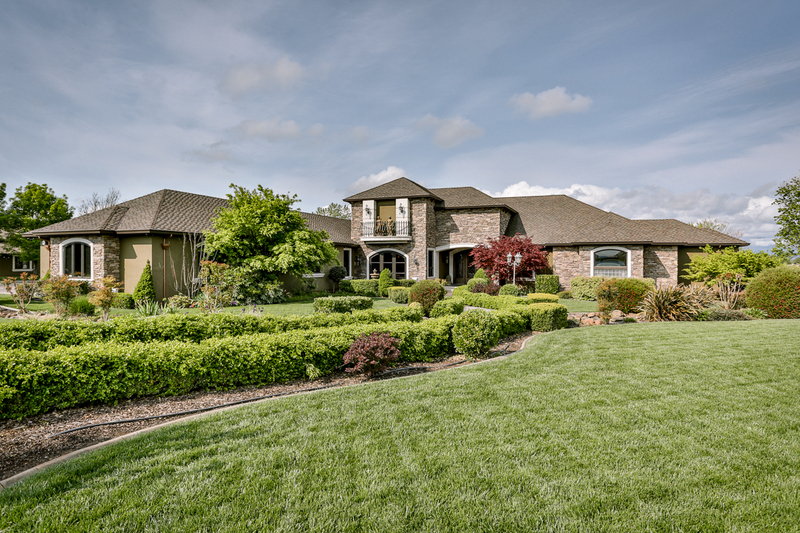 7180 Del Rico Court | SHASTA COUNTY’S FINEST ESTATE. 5 minutes from the local airport, convenient to Bay area and beyond, this home has it all. 4 bedroom, 6 baths, 6000-sq. ft.home with guest house, huge RV shop, and large pool with swim up bar nestles on 30 acres surrounded by mountains and bordered by 1,100 acres of wildlife preserve. Unparalleled peace, security, and convenience of shopping, dining and year-round recreation options just minutes away. Solar 40KW, with overages in excess of $200.00 a month. Get access to all of our HD quality photos of this remarkable home! Tour the finest home in Shasta County. Hello and goodbye are more than just words with this custom Smart Home System that covers the whole house; they are one-touch commands. The Crestron whole house audio and video system put the entire property at your fingertips. Besides the main keypad, room-specific remotes give you control of all electronics in that area. Select the “Good night” button on any remote and it will shut off all the lights in the house, and that’s just the beginning. Remote controls for every room and a touch panel keypad in the kitchen enable you to choose which room(s) to turn on, which music to play and from which source, as well as volume levels. The Crestron System also communicates with the Lutron HomeWorks, #1 in the nation for whole house lighting systems. An Astronomical Time Clock which can be programmed to turn on certain lights at certain times and for different times of the year to accommodate the seasons. Vacation mode remembers which lights you turn on during the day, computes it through an algorithm, and times those lights to come on in the usual pattern as if someone is still home. 12 security system cameras enable you to see what the cameras are seeing. Touch the appropriate button and it pops up on the nearest TV. Cameras are constantly being recorded 24-7 onto a dvr, so you can go back later, to check out what was happening at a certain time of the day. Whether at home or on vacation, you can monitor this palatial estate. It can also be set to sense motion and send you a jpeg picture of the postman at the gate or the dog at your back door. Hit #7 and page the whole house from the phone to let people know it’s time to eat. This can also be used when someone presses the button on the gate, it rings the house phones and you can talk to them, and also press a button on the house phone to let them in. If you hear the phone ringing, you can pick up and talk regardless if the house audio is on or off. Completely re-programmable to allow customization as needs change. The lighting system has also been installed on car visor units, so as you arrive at the gate, one button opens the gate. Another starts the programmed light show to levels of your desire, lighting your way to the house. Add music of choice to that welcoming process. All ceiling fans are programmed through the Crestron system. Sprinklers, pool, and more are all similarly controlled. Source: Shell Wright, a licensed C7 contractor. OLD WORLD CRAFTSMANSHIP MEETS WORLD CLASS ELEGANCE AND TECHNOLOGY. Estate and Local natural beauty. Bistro, BBQ, Wet Bar, and Patio. Giant shop and 2nd Office with Shower. Unrivaled Elegance, complimenting Practicality and Comfort. Family Room and Breakfast Nook. Game Room, Guest House, and More!